A screenshot of the video, which shows Poncho performing CPR on his handler. 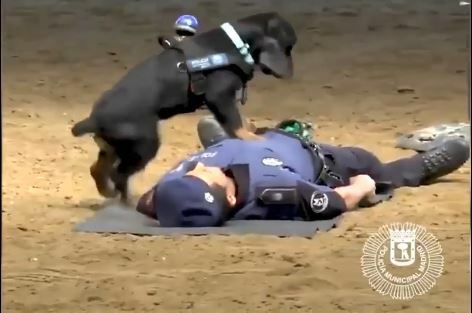 Police dogs are being trained to perform CPR in the most adorable fashion. The Madrid police have released a video showing how a police dog was trained to save lives by performing CPR. In the demonstration, after his handler ‘collapses,’ Poncho, sporting a vest with a blue emergency light on it, runs over and starts jumping on his chest. All the while, the dog intermittently puts his head on the officer’s neck to check for a pulse. Over 1.7 million people watched the video since it was uploaded three days ago.